WASHINGTON — President Donald Trump is taking his first steps aimed at scaling back financial services regulations, and the Republican-run Congress cast a vote early Friday signaling that it's eager to help. The president signed an executive order that will direct the Treasury secretary to review a 2010 financial oversight law, which reshaped financial regulation after the 2008-09 financial crisis. 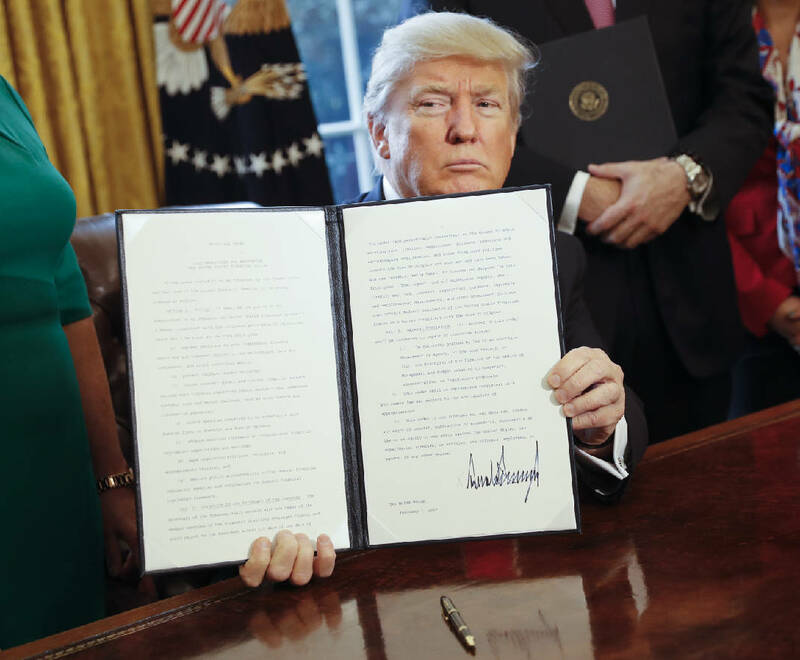 Trump also signed a presidential memorandum that instructs the Labor Department to delay implementing an Obama-era rule that requires financial professionals who charge commissions to put their clients' best interests first when giving advice on retirement investments. While the financial oversight order won't have any immediate impact, the administration's intent is clear. "The Dodd-Frank Act is a disastrous policy that's hindering our markets, reducing the availability of credit and crippling our economy's ability to grow and create jobs," said Press Secretary Sean Spicer. Earlier Friday, the Senate used an unusual pre-dawn vote to approve legislation, 52-47, killing a regulation that has required oil and gas companies to disclose payments to the U.S. or foreign governments for commercial development. The House approved the measure this week, and Trump is expected to sign it. Republicans said the rejected regulation gives foreign competitors valuable information about U.S. firms and would hurt the economy. Democrats said erasing the requirement means big companies will be able to hide questionable dealings with foreign governments like Russia. Trump pledged during his campaign to repeal and replace the Dodd-Frank law, which also created the Consumer Financial Protection Bureau. A senior White House official outlined his executive order in a background briefing with reporters Thursday. "Dodd-Frank is a disaster," Trump said earlier this week during a meeting with small business owners. "We're going to be doing a big number on Dodd-Frank." The shorthand name for the law refers to its Democratic sponsors, former Sen. Chris Dodd of Connecticut and former Rep. Barney Frank of Massachusetts. The president said he'd be discussing the topic with top CEOs and banking executives at a meeting Friday morning at the White House, where attendees included Jamie Dimon, the CEO of JPMorgan Chase. "There's nobody better to tell me about Dodd-Frank than Jamie, so you're going to tell me about it," Trump said. He told the group that he expects his administration "to be cutting a lot out of Dodd-Frank because frankly I have so many people, friends of mine that have nice businesses that can't borrow money. They just can't get any money because the banks just won't let 'em borrow because of the rules and regulations of Dodd-Frank." Trump's order won't have any immediate impact. But it directs the Treasury secretary to consult with members of different regulatory agencies and the Financial Stability Oversight Council and report back on potential changes. That likely includes a review of the CFPB, which vastly expanded regulators' ability to police consumer products — from mortgages to credit cards to student loans. Trump administration officials, like other critics, argue Dodd-Frank did not achieve what it set out to do and portray it as an example of massive government overreach. "Banks are forced to hoard money because they're forced to hoard capital and they can't take any risk. We need to get banks back in the lending business," said White House National Economic Council Director Gary Cohn in an interview with Fox Business Network. "That's our number one objective." Trump also signed a presidential memorandum Friday that instructs the Labor Department to delay implementing the "fiduciary rule," which was aimed at blocking financial advisers from steering clients toward investments with higher commissions and fees that can eat away at retirement savings. The rule, which was set to take effect in April, will be delayed for 90 days while it's reviewed. Critics argue the rule limits retirees' investment choices by forcing asset managers to steer them to the lowest-risk options.